Tesla CEO Elon Musk said he expects the new Model Y SUV to outsell the Model S and Model 3 combined. “I think it’s really compelling. 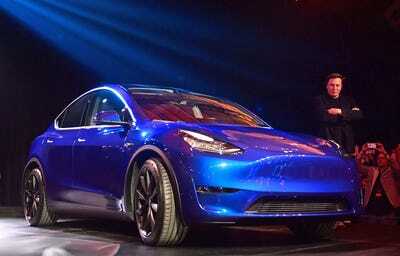 I’m confident that of any mid-sized SUV, it will be the one you want,” Musk said at the Model Y unveiling event in Hawthorne, California, on Thursday evening. Tesla opened up orders for the long-range and Performance versions of the Model Y after the event. Customers can place their orders on the company’s website for a deposit of $US2,500. “While the unveil of the Model Y could drive incremental reservations- given a much larger global market for crossovers than sedans – and help cash balances given likely deposit collection, this new product could further weigh on Model 3 demand as consumers decide to wait a little longer to purchase a Tesla crossover vehicle (a segment that has seen significant increases in demand across the major auto markets the past few years),” Goldman analysts said. FREDERIC J. BROWN/AFP/Getty ImagesTesla CEO Elon Musk views the new Tesla Model Y at its unveiling in Hawthorne, California on March 14, 2019. The long-range rear-wheel drive begins pricing at $US47,000 before incentives and has a range of 300 miles per charge. The dual-motor all-wheel drive will have a range of 280 miles per charge and begins pricing at $US51,000 before incentives. The Performance model will also have a range of 280 miles, but will begin pricing at $US60,000. According to Tesla’s website, the company plans to begin manufacturing these three versions late next year. But customers can place an order now on the company’s website for a deposit of $US2,500. The standard Model Y version will have a range of 230 miles per charge, a top speed of 120 miles per hour, and begin pricing at $US39,000. The SUV will also be able to go from 0-60 mph in 5.9 seconds, Tesla says.